High quality peanut butter that is never oily and never dry. This silky smooth peanut butter is so easy to spread over your bread and has that great peanut flavour you know and love. 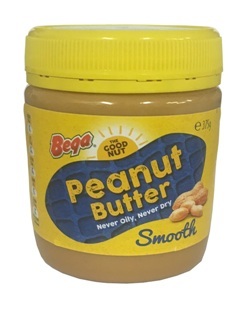 Kraft Peanut Butter will now be produced under the name Bega Peanut Butter. After company takeovers and demergers involving Kraft, the Peanut Butter will no longer use the brand name Kraft. It is still the same recipe from the same factory.